2 of the bugs from last week is fixed. The third needs more investigation as something weird is going on and I haven’t quite figured it out yet. It’s about reversing lists which I’ve never done before. The screenshot shows one of the bugs (that is now fixed) in action. On the bottom left the border goes on top of the card in front of it. 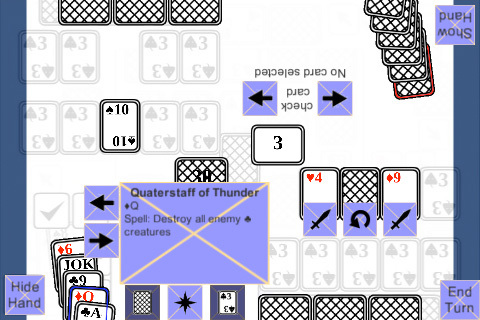 I also found a new bug: playing the first card in your hand keeps the border around it when it shouldn’t. What’s next: fixing the bugs and then hopefully being able to get the spell confirmation button.